Fashion and accessories, interior decorations, animals, items for daily use, but also formidable works of art, both in- and outdoors: All these can be made with wool, water and soap. There is hardly a material that can beat the versatility of wool. 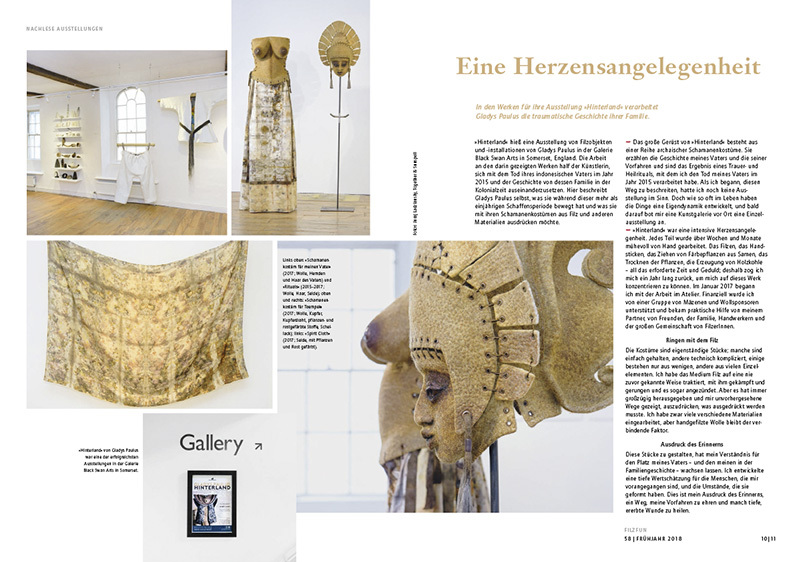 We present many examples for this astounding variety in the filzfun spring issue: The internationally renowned artist Gladys Paulus has come to terms with the colonial history of her Indonesian family in her exhibition of archaic shaman costumes called Backlands. The members of the Dutch organisation ViltKontaktGroep have watched over several months how the felt art objects for the outdoors exhibition BuitenGewoonVilt in Appeltern have changed under the influence of wind and weather – an exciting documentary! 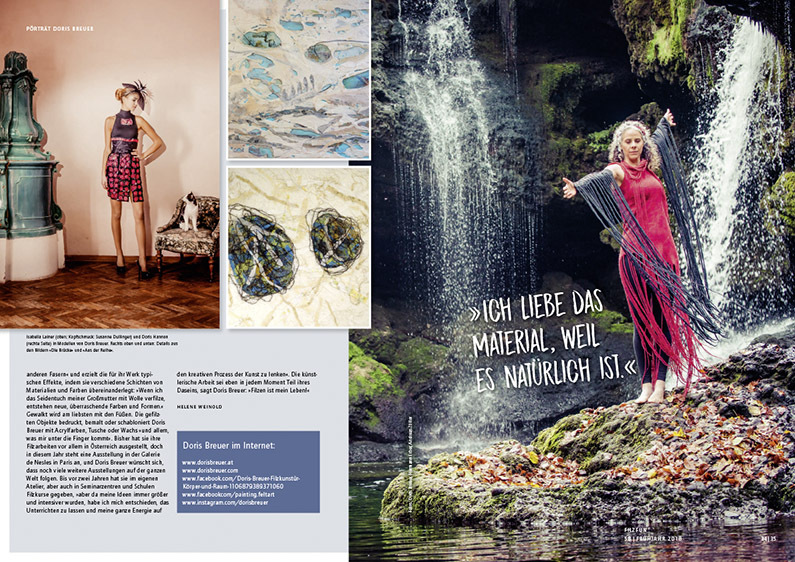 German artists have participated with great success in the seventh biennale of the World Textile Association held in Uruguay: We look back on this event and show some of their impressive works of art. 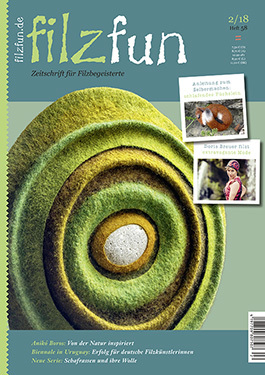 Doris Breuer from Austria designs extravagant felt fashion and makes images out of wool. 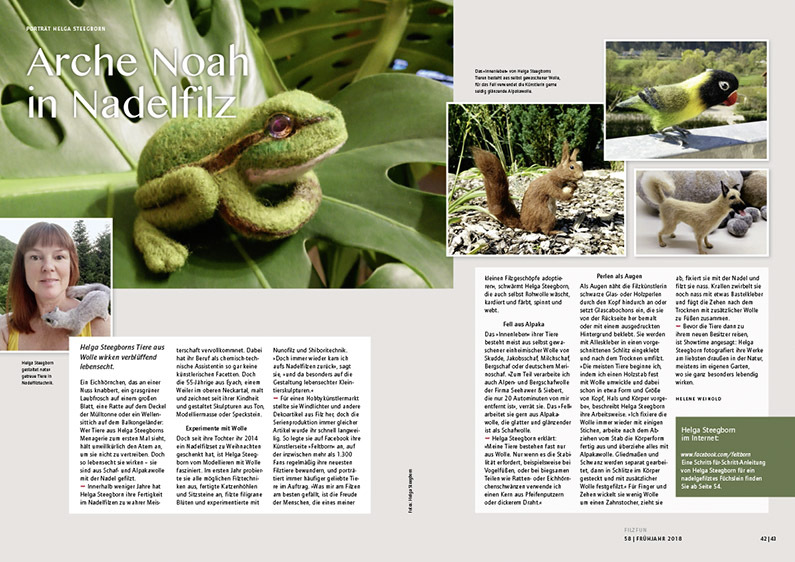 Helga Steegborn, on the other hand, has specialized in true-to-life, needle-felted animals. Accept her invitation to create a sleeping little fox following detailed step-for-step instructions. 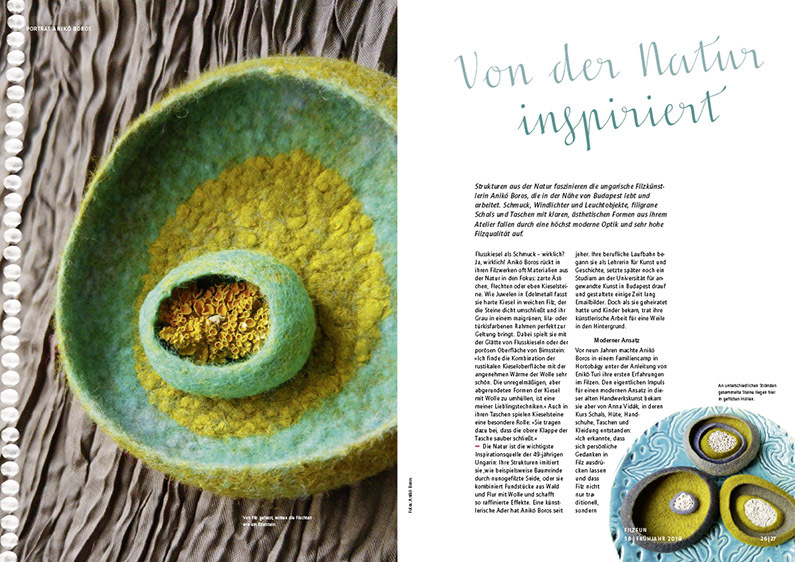 Anja Schrik has been experimenting for years with natural dyes for wool and fabrics. In the filzfun spring issue, she shares one of her dyeing recipes from her latest book with our readers. sheep wool. 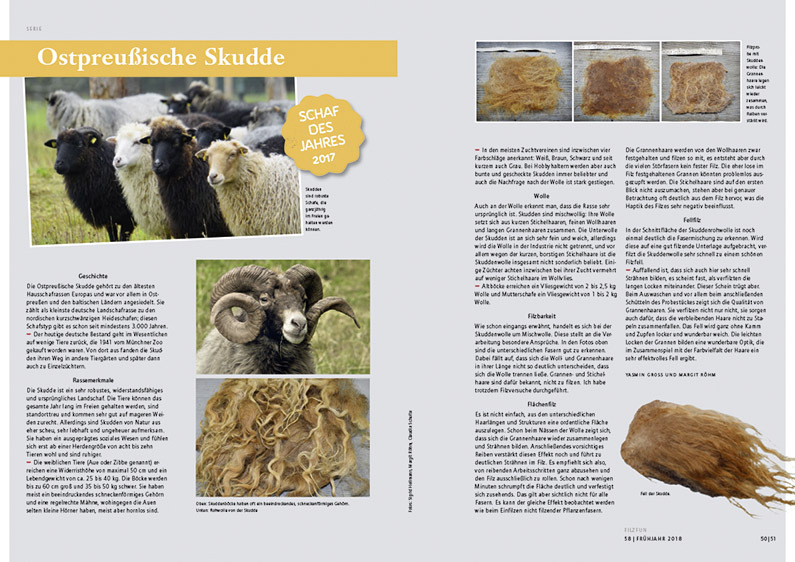 We start with a new series »Sheep & Wool« where Margit Röhm and Yasmin Groß present different kinds of sheep and scrutinize their wool and felting characteristics. For a greater public esteem of sheep wool, also Susanne Breuling stands for, in co-operation with a sheep holder from the Black Forest. 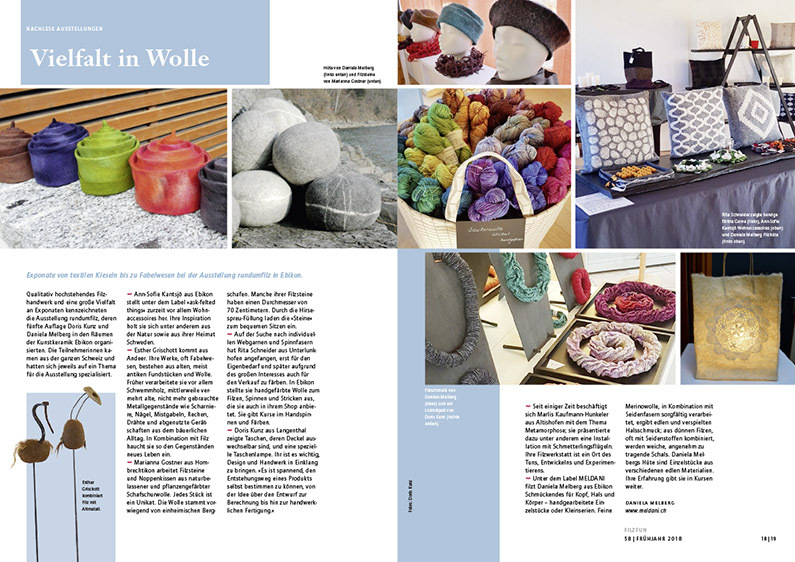 Whoever likes to tread new paths with regard to felting, wants to get acquainted with a range of new techniques, wants to process raw wool or to felt clothing will find a wide spectrum of workshops in the preview of the felting education programs of the Filz-Netzwerk or an international education offered by wollmodus. Under the more than 200 offers in the schedule attachment you are sure to find a course or exhibition in your area.